I'm working with the sweetest client ever on her master bathroom makeover. Electrical and trim work are taking place next week, but I thought I'd show you a few of the elements we're incorporating into the design. Can't tell in the photos, but her mirror is wider than his. The vanities are across from each other and are different sizes. 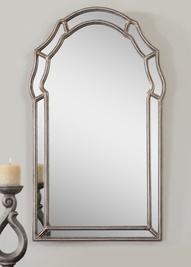 Hers can accommodate a larger mirror than his, hence the different styles. (This was one of those decisions I pondered a lot at 3am). I am absolutely loving this Magnolia "Powell" fabric! I love that you're using different mirrors in there and the fabric is awesome! I've been looking for the right fabric for my master bath... something with pale blue and coral, I think. Looks like it will be gorgeous! Sounds like a nice size bathroom. Love the fabrics you're considering. Oooooh! i can't wait to see that!! Love the choices. I don't think I knew that you decorate for others. That is great. Love this fabric. Who is the manufacture? Cant wait to see it. 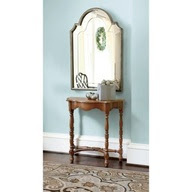 Great idea to mix up the mirrors...I did that in our powder room and i think it adds interest. Love all the elements you are using and the fabric is fabulous. Yes, i did lightly sand the cabinets. With the oil based primer you don't really have to but I still give it a small buffing. The power of all the color correspondence gives off a very well decorated and warming feeling in the rooms, very well achieved!! Can't wait to see more!! Love the fabric. Where did you get it? Cant wait to see it. I like how both a girl and a girl have their own minors.